This is exciting news, because we don't see Northern Finches, like the Pine Siskin, in Maryland every winter! If you’re wondering what all the excitement is about, see our new Pine Siskins page that’s totally devoted to these tiny nomads. The Droll Yankee Bottoms Up Feeder allows Pine Siskins access but denies other birds who do not feed upside down, like House Sparrows. 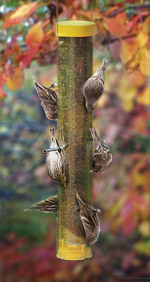 Pine Siskins Follow the Food! Like American Goldfinches, Pine Siskins are easily attracted to feeders filled with nyjer (thistle) or our Finch Favorite, a nutritious nyjer blend that includes fine sunflower pieces. Pine Siskins will also feed upside down! A Bottoms Up Feeder by Droll Yankee is perfect and will keep pesky house sparrows away. Pine Siskins can also be spotted clinging to the tips of conifer branches, picking through cones for tasty seeds and helping to deadhead those seedy weeds in your garden. In a year when we see Pine Siskins in our area, it's not unusual that other Northern Finches such as Common Red Polls and Purple Finches will also make an appearance. Keep your eyes open and your feeders full! Please share your sightings with us on Facebook.